We offer a wide range of polishing cloths which are ideally suited for the preparation of metallographic specimens and other materials needing an extremely fine finish. They are available in a Pressure Sensitive Adhesive (PSA) as well as Plain Backing (PB); with 2½" diameter hole on the center or No Hole (N/H). 100% virgin wool sheared pile. Recommended for intermediate and final polishing steps. A non-woven textile cloth which is both oil and water resistant. Recommended for intermediate and final polishing with diamond abrasive compounds. Excellent flatness. A fine stainless steel mesh on an aluminum foil polyethylene backing. Extremely durable material and, excellent removable rate when used with a diamond compound in the 45 to 60 micron range. Recommended for coarse and intermediate polishing. A durable napless nylon weave. It provides excellent finish on most materials. This flocked cloth is made by binding a rayon flock to a woven cotton backing; it is the most popular in our line. It is excellent for final polishing when used in conjunction with diamond or alumina polishing compounds. A long napped rayon flock with a plastic barrier. This is a finer version of our Glenco cloth especially designed for superior final polishing. For best results, use with our diamond polishing compound. 100% pure woven silk for intermediate, final, or skid polishing on friable materials. This cloth has been especially designed for long life. Made from a rayon flock on a cotton canvas backing. It is recommended for all final polishing. A selective diamond particle resin bonded to a uniform 3-mil polyester film backing. Excellent for polishing samples with differing hardness. Ideal for the preparation of cross sections for SEM/TEM analysis. 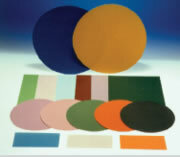 Comes in 8" and 12" discs with plain back (P/B) or pressure sensitive adhesive back (PSA). *Pricing for 50350-35 30µ is $32.00. True Blue™ film is produced with a proprietary process combining a unique mixture of abrasive particle sizes and shapes that are bonded to a film backing which enable the film to produce finer surfaces than are commonly found in similarly graded micron films. True Blue™ film is typically used after the 1micron diamond lapping film step and provides a flat, nearly scratch-free surface. Alumina is widely used in sample grinding and polishing. Our Aluminum Oxide Abrasive film with a PSA back or a plain back are ready to use in all sample polishing applications.